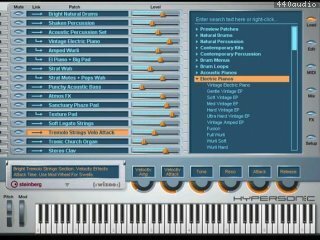 Hypersonic is a compositional workhorse and an expandable, high-performance sample player/synthesizer. The software takes the musical instrument workstation concept to computer-based music production environments, offering higher quality, easier use, and more effective playability. Windows XP Home or XP Professional Intel / AMD Prozessor 1.4 GHz minimum 512 MB RAM DVD drive required for installation Windows MME compatible audio hardware is required (ASIO compatible audio hardware required for low latency operation). Steinberg Key (copy protection device) and USB port required* Internet connection required for license activation For usage as plug-in, a VST (VST 2.3 or higher) or DXi2 compatible host is required. For usage as Rewire slave device, a Rewire compatible host is required.